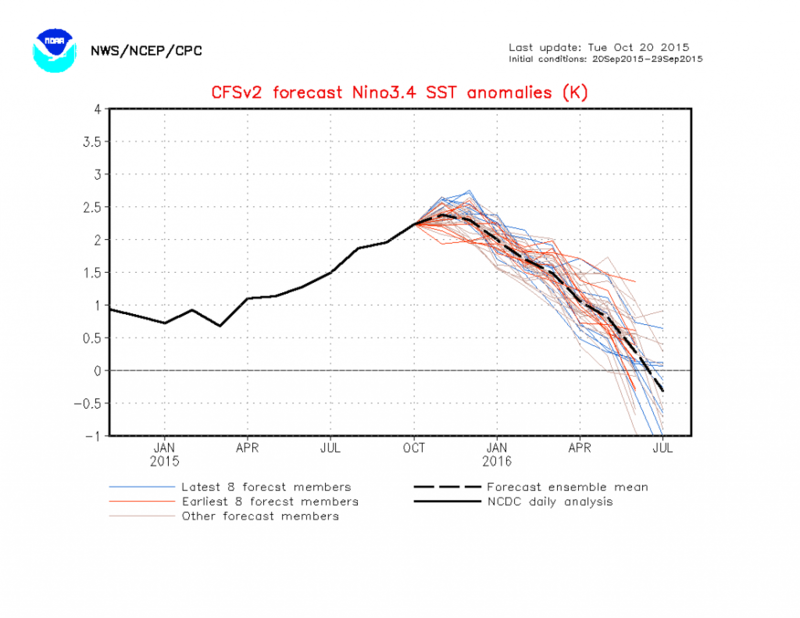 What do we expect this coming winter now that the strong El Niño is here? Mike Halpert of NOAA discusses the likely conditions across the US in the Climate.gov blog post here and shows the variation of previous El Niño winters from strong to weak years. Even in the strong years, there is still quite a variety of climate outcomes from one event to the next. In the Southeast, the signals for above normal precipitation are much more consistent from one El Niño to the next than temperature. If you are interested in more graphics on the current El Niño, there is a good collection at DaculaWeather here. 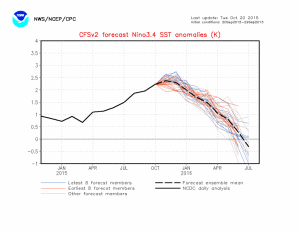 One thing that really strikes me is the strong decay of the El Niño that is predicted to occur by all the models in the April to July time frame. Many of the models also predict that the tropics will cross over to the opposite phase, La Niña, later in the summer. Often La Niñas are associated with dry summer conditions and increased Atlantic tropical storm activity (which could counteract the dry conditions if the storms make landfall) in late summer into fall, so that will be something to watch for next growing season. Posted in Climate and Ag in the news, Climate science, El Nino and La Nina, Tropical weather. Bookmark the permalink.